CARFAX 1-Owner, Just Arrived, LOW MILES - 18,463! REDUCED FROM $17,500!, EPA 35 MPG Hwy/25 MPG City!, $1,400 below NADA Retail! RUBY FLARE PEARL exterior and BLACK interior. iPod/MP3 Input, Bluetooth, Back-Up Camera, Aluminum Wheels. CLICK NOW! Back-Up Camera, iPod/MP3 Input, Bluetooth. Rear Spoiler, MP3 Player, Aluminum Wheels, Keyless Entry, Remote Trunk Release, Steering Wheel Controls, Child Safety Locks. Toyota SE with RUBY FLARE PEARL exterior and BLACK interior features a 4 Cylinder Engine with 178 HP at 6000 RPM*. Serviced here, Non-Smoker vehicle, Free Vehicle History Report, Just Arrived, CLEAN CARFAX. Was $17,500. This Camry is priced $1,400 below NADA Retail. CARFAX 1-Owner, Just Arrived. FUEL EFFICIENT 33 MPG Hwy/24 MPG City!, $500 below NADA Retail! PREDAWN GRAY MICA exterior and ASH/BLACK interior. Sunroof, iPod/MP3 Input, Bluetooth, Back-Up Camera, MOONROOF PACKAGE, Alloy Wheels READ MORE! Back-Up Camera, iPod/MP3 Input, Bluetooth. Rear Spoiler, MP3 Player, Aluminum Wheels, Remote Trunk Release, Keyless Entry, Child Safety Locks, Steering Wheel Controls. MOONROOF PACKAGE: power tilt/slide moonroof. Toyota SE with PREDAWN GRAY MICA exterior and ASH/BLACK interior features a 4 Cylinder Engine with 178 HP at 6000 RPM*. Serviced here, Non-Smoker vehicle, Free Vehicle History Report, Just Arrived, CLEAN CARFAX. Edmunds.com explains The 2017 Toyota Camry provides one of the most comfortable and spacious cabins of any midsize family sedan. There's plenty of headroom and legroom up front and nearly as much in back, where even taller adults will be content to ride for extended periods.. Great Gas Mileage: 33 MPG Hwy. This Camry is priced $500 below NADA Retail. CARFAX 1-Owner. PREDAWN GRAY MICA exterior and BLACK interior, SE trim. FUEL EFFICIENT 33 MPG Hwy/24 MPG City! Bluetooth, Back-Up Camera, Alloy Wheels. AND MORE! Back-Up Camera, Bluetooth, Aluminum Wheels Rear Spoiler, MP3 Player, iPod Input, Remote Trunk Release, Keyless Entry. Toyota SE with PREDAWN GRAY MICA exterior and BLACK interior features a 4 Cylinder Engine with 178 HP at 6000 RPM*. FUEL EFFICIENT 35 MPG Hwy/25 MPG City! CARFAX 1-Owner, Toyota Certified, Superb Condition, GREAT MILES 15,871! SE trim. Back-Up Camera, Bluetooth, Alloy Wheels, BODY SIDE MOLDINGS, Serviced here, Non-Smoker vehicle, Towing Hitch SEE MORE! Back-Up Camera, Bluetooth, Aluminum Wheels Rear Spoiler, MP3 Player, iPod Input, Keyless Entry, Remote Trunk Release. BODY SIDE MOLDINGS. Toyota SE with Ruby Flare Pearl exterior and Black interior features a 4 Cylinder Engine with 178 HP at 6000 RPM*. Serviced here, Non-Smoker vehicle, Towing Hitch. CARFAX 1-Owner. LE trim, PREDAWN GRAY MICA exterior and BLACK interior. EPA 39 MPG Hwy/28 MPG City! Smart Device Integration, Lane Keeping Assist, Bluetooth, Aluminum Wheels, Back-Up Camera. READ MORE! Back-Up Camera, Bluetooth, Aluminum Wheels, Smart Device Integration, Lane Keeping Assist MP3 Player, iPod Input, Remote Trunk Release, Keyless Entry, Child Safety Locks. Toyota LE with PREDAWN GRAY MICA exterior and BLACK interior features a 4 Cylinder Engine with 203 HP at 6600 RPM*. Clean Car Fax No Accident or Damage Reports, Serviced Here, Non-Smoker Vehicle, We Did A 182 Multi-Point Inspection, Service Records Available. Back-Up Camera, Bluetooth, CD Player, Aluminum Wheels Rear Spoiler, MP3 Player, Remote Trunk Release, Keyless Entry, Child Safety Locks. 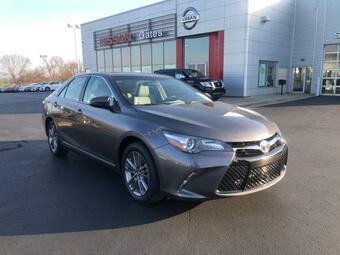 Toyota SE with Celestial Silver Metallic exterior and Black interior features a 4 Cylinder Engine with 178 HP at 6000 RPM Call To Set Up Your Test Drive (859)779-1000. Clean Car Fax No Accident or Damage Reports, Serviced Here, Non-Smoker Vehicle, We Did A 182 Multi-Point Inspection, Service Records Available, Call To Set Up Your Test Drive (859)779-1000. CARFAX 1-Owner. Heated Leather Seats, Moonroof, Nav System, Dual Zone A/C, Back-Up Camera, Aluminum Wheels, RADIO: ENTUNE PREMIUM AUDIO W/NAVIGAT... CONVENIENCE PACKAGE, BLIND SPOT MONITOR, RADIO: ENTUNE PREMIUM AUDIO W/NAVIGATION/APP SUITE, REMOTE START, MOONROOF PACKAGE. MOONROOF PACKAGE power tilt/slide moonroof, CONVENIENCE PACKAGE HomeLink Universal Transceiver, EC Auto-Dimming Rearview Mirror w/ Compass, Alarm & Immobilizer Anti-Theft System, Push Button Starting System, Smart Key System w/Panic Wireless Door Lock, driver door, passenger and trunk, RADIO: ENTUNE PREMIUM AUDIO W/NAVIGATION/APP SUITE Entune multimedia bundle, 7 high-resolution touch-screen display, AM/FM CD player, MP3/WMA playback capability, 6 speakers, auxiliary audio jack, USB 2.0 port w/iPod connectivity and control, advanced voice recognition, hands-free phone capability, phone book access and music streaming via Bluetooth wireless technology, Entune app suite, HD Radio, HD predictive traffic and doppler weather overlay, AM/FM cache radio and SiriusXM radio, Entune app suite includes Bing, Facebook Places, iHeartRadio, MovieTickets.com, Open Table, Pandora and Yelp, real-time info including traffic, weather, fuel prices, sports and stocks, Access to Entune services is free, See Toyota.com/entune for details, BLIND SPOT MONITOR rear cross-traffic alert, REMOTE START.